Before we start deploying our application to Elastic Beanstalk, let us do a quick revision on the fundamentals of Elastic Beanstalk. Throughout the survival guide, we will be using terms that might not be familiar to you. Hence, it is important to get everyone on the same page before embarking on the rest of the survival guide. If you have any experience with AWS, you should have known by now that AWS loves to come up with their own set of terminology which can throw you off. A Elastic Beanstalk Application is like our project folder. So if we have a project named “helloeb”, we will name our Elastic Beanstalk Application as helloeb. 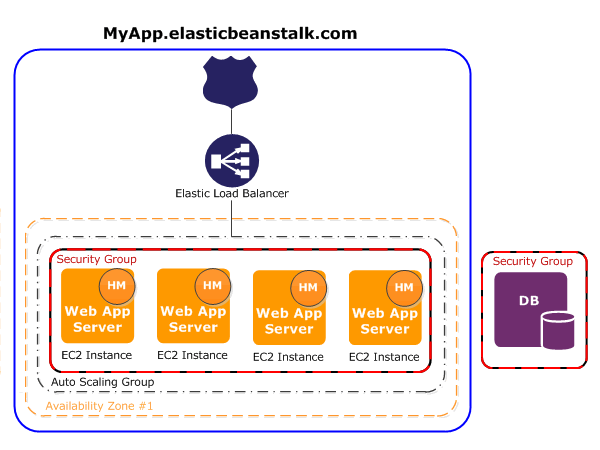 Your application does not run within the Elastic Beanstalk Application. Remember, it is just a folder, right? Instead, your application is deployed and runs in an environment. We create environments within Elastic Beanstalk Application which house different running version of our application. For example, a project might have both staging and production versions. We will then create two environment (helloeb-staging & helloeb-production) within the same Elastic Beanstalk Application. Application and Environment View in management console. Take note: We can technically create separate Elastic Beanstalk Application for two different application version. However, it is best practice to group relevant application versions under the same Elastic Beanstalk Application. The web server tier handles HTTP(S) requests while worker tier handles background-processing tasks. In this survival guide, we will be mainly talking about the web server tier. From the management console, we are able to monitor our environment health in 4 different state with their respective colors. Green - Environment has passed health checks. At least one EC2 connection is healthy and receiving request. However, this does not necessarily mean that your application is up and running. Gray - Environment is currently updating. No deployment or management can take place when the health status is gray. Yellow - Environment only partially passed health checks. Health checks are not consistently passing. Red - Environment consistently fails health checks. Most likely environment resources are down. Check on the relevant resources like EC2, load balancers, RDS, etc. How do Elastic Beanstalk conducts health checks? For a single instance environment, Elastic Beanstalk just monitor its EC2 instance status. For a load-balanced environment, the load balancer will open a TCP connection with each instance every 30 seconds. If the instance acknowledges the connection, the instance is considered healthy. Although Elastic Beanstalk comes with a nice management console for application management, we highly recommend to use it together with the Elastic Beanstalk CLI tool - eb for maximum efficiency. It is crucial to understand the Elastic Beanstalk architecture and what resources were provisioned for us. Once we have good understanding of the big picture, we will be able to troubleshoot accordingly when the environment experiences red health status. In fact, the architectural overview is not that complicated. Let's step through them in detail from the top to bottom. Diagram of the architectural components of a web server tier environment. First, we see that the solid blue line outlined the entire scope of a single environment. Within a Elastic Beanstalk Application, every environment is isolated from one another. All environment has a human-readable URL for easy access. Elastic Beanstalk provisioned for Amazon Route 53 to forward any requests to the CNAME record. Take note that the CNAME record is pointing towards the load balancer and not the instances. As the instances belong to an auto-scaling group, the instance’s IP address is not static. Hence, if we point the CNAME to an instance, it will break when Auto Scaling decide to terminate the particular instance. Elastic Beanstalk will also provision a load-balancer to manage and direct traffic to multiple instances during high load. But when do the environment know to spin up new instances? This is solved by having an auto-scaling group. Once traffic surge pass a preset limit, Auto Scaling is triggered to spin up new instances to handle the high load. If traffic has reduced past a certain threshold, Auto Scaling will terminate excess instances. We have come to the end of Chapter 2 of "AWS Elastic Beanstalk Survival Guide" and we are just getting started. In the next chapter, we will be seeing some real action with application deployment. So stay tuned.